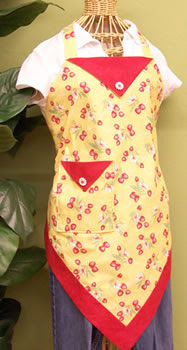 Beverly's Official Blog | News and findings from world of crafts, scrapbooking and more: Easy Apron to Make - So Cute! Here's a super easy apron to make ...... the pattern is from Four Corners Apron and the fabric used in the apron shown is from the 1930's reproduction fabric line of Darlene Zimmerman's Clothesline Club - Fresh Picked. The red trim fabric is from Michael Miller.